During the 1980s I worked in the Portakabin, affectionately known as 'the shed' at the rear of the council offices in King George Street, between the Borough Arcade and South Street. On the wall Immediately behind where I sat was the plaque, photographed below, in memory of Charlie Gillard. 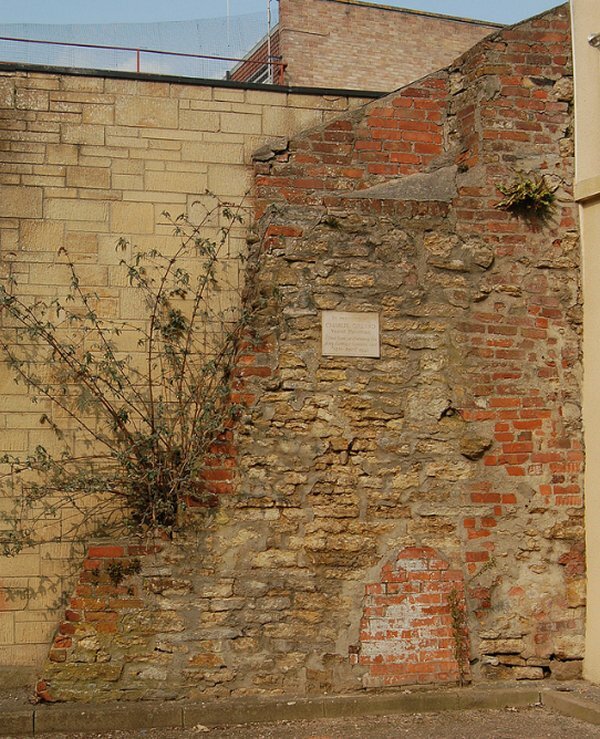 It was fixed to the remains of what had been Yeovil's Corn Exchange and stated that he had been "killed here performing his duty during a bombing raid". I often wondered what the story behind the plaque was and, during the several years I sat just a few feet away from the plaque, I noticed many people stop to read the inscription - no doubt wondering the same as me. Charles Henry Gillard, known as Charlie, was born in Yeovil in 1903, the son of Charles Gillard (1866-1912) and Elizabeth Ann née Smith (1869-1948). Charles Snr was originally from Crewkerne but by 1901 was living at 70 Hendford with his second wife, Elizabeth, daughters Beatrice and Mabel (from his first marriage) and one year-old Ethel and 7 month-old baby Lionel. Charles listed his occupation as 'Head Ostler, Livery Stables'. In fact the family was living in the ostler's accommodation situated in the stables belonging to the Three Choughs Hotel, located in the junction between Hendford and West Hendford that later became the Chough's garage and car park for guests and residents - photographed below. In the 1911 census Charles and Elizabeth were still at 70 Hendford but by this time they had another four young sons, including 8-year old Charlie. Sadly Charles Snr died the following year leaving his widow, Elizabeth, to raise the seven children still living at home although, since they were in accommodation tied to her late husband's job, they undoubtedly had to move. In 1923, at the age of 23, Charlie married Ada Sutton in Yeovil and they set up home at 134 Hill Crest Road. They were to have one son, Dennis. During the 1920s Charlie started work at the Yeovil & District Co-operative Society's bakery, which was located behind the Co-op's first branch outlet in Orchard Street. Charlie was to work at the bakery for the next fourteen years. Before the start of the Second World War Charlie joined the Auxiliary Fire Service (AFS) when it was first formed in 1938 and he was to serve for the next three years. The AFS was created as part of Civil Defence Air Raid Precautions to supplement the work of regular fire brigades at a local level. Members of the AFS were unpaid part-time volunteers, but could be called up for whole-time paid service if necessary. This was very similar to the wartime establishment of the Police Special Constabulary. 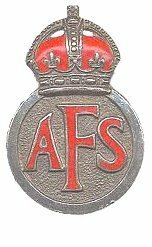 The part-time firemen of the AFS were recognised by a lapel badge, seen here, first issued in August 1938 after completion of sixty hours training, reduced in June 1939 to one month of membership. The badge was made of sterling silver until June 1939 when it became white metal. On Good Friday, 11 April 1941, late in the evening several incendiary bombs and delay-action bombs hit Yeovil town centre in the sixth German air raid on the town. The delay-action bombs were designed to explode some time after impact, with the bomb's fuses set to delay the explosion for a period lasting anywhere from just a few seconds to several weeks. Short delays allowed the bomb to penetrate before exploding whereas longer delays were intended to disrupt bomb disposal and other activities as well as spreading terror. All the bombs exploded before the 'all-clear' siren sounded with one destroying the Medical Hall in the Borough and another killing four soldiers and wounding a further five soldiers of the King's Own Scottish Borderers billeted in the Corn Exchange behind the municipal offices in King George Street. The Corn Exchange was nearly completely destroyed but a fire was raging in the ruins. 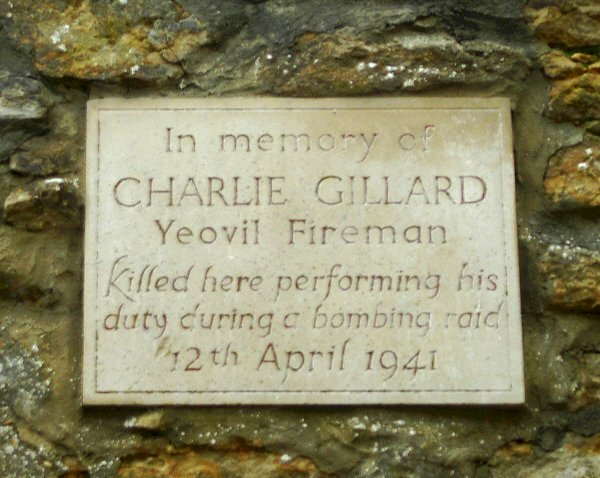 While fighting the fire in the Corn Exchange, Auxiliary Fire Service Patrol Officer Charlie Gillard was killed when the delay-action bomb exploded in the Corn Exchange in the early hours of 12 April. The Western Gazette reported on Charlie's funeral, in its issue of 25 April 1941, as follows - "Much sympathy has been extended with Mrs A Gillard in the death of her husband, Mr Charles Henry Gillard of 134 Hill Crest Road, at the age of 37. Mr Gillard was well known and highly respected. Born in Yeovil, he was the third son of the late Mr Charles Gillard and Mrs Gillard, and he was for 14 years in the employment of the bakery department of the Co-operative Society. By his death the Yeovil Auxiliary Fire Service has lost a member whose three years service was highly valued. Mr Gillard leaves a widow and one son aged 14 years. Impressive tributes were paid at the funeral at the Cemetery on Thursday. The Vicar of Yeovil (Rev H Mortlock Treen) and the Rev ACA Sellick officiated. The chief mourners were:- The wife, Mr Dennis Gillard (son), Mrs E Gillard (mother), Mrs E Bisgrove (sister), Messrs Lionel, Leslie and William Gillard (brothers), Mrs Leslie Gillard and Mrs W Gillard (sisters-in-law), Mr and Mrs H Smith (uncle and aunt), Mr and Mrs H Dodge (father-in-law and mother-in-law), Mr and Mrs Wm. Hill, Mr E Sutton, Mrs V Henwood, Mr and Mrs T Rendell, Mr and Mrs Francis, Mr and Mrs R Williams and Mr and Mrs N Salter (brothers-in-law and sisters-in-law), and Mr Chapman (friend). The coffin, upon which rested the deceased’s helmet, was born on one fire engine, and another was used to carry the numerous flowers. A section of a military band, the Pipes Band and Section of the King’s Own Scottish Borderers, led a procession of many organisations from King George Street to the cemetery, where a large number of friends and townspeople were gathered to pay their last tribute of respect. The Mayor of Yeovil (Mr S Duckworth), the Deputy Town Clerk (Mr AR McMillan) and Captain Mitchell (Chief Officer of the Fire Brigade) attended. Also members of the Corporation, representatives of the Police, Yeovil Borough Company Home Guard, ARP Service, the British Legion, the Observer Corps, VAD. and First Aid Party, Co-operative Society, District Fire Brigades, Salisbury, Bridgwater and Weymouth Fire Brigades, Regular Service of Yeovil Fire Brigade, Yeovil AFS and Westland Fire Brigade. After the interment “Last Post” was sounded by trumpeters." 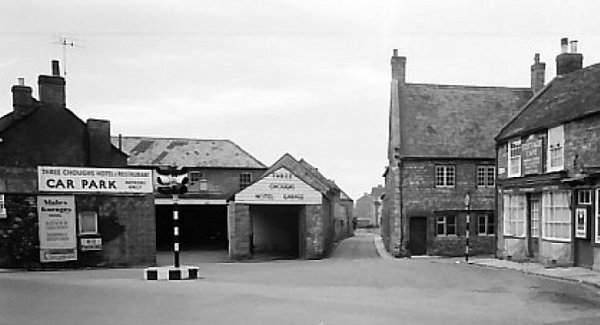 The Three Choughs garage and car park, formerly the Choughs' livery stables, with the Ostler's house at the rear where Charlie Gillard grew up, is seen with Hendford running off at the left and the narrow entrance to West Hendford at centre, next to which is the Oxford Inn, the even narrower entrance to Waterloo Lane and then the Cottage Café. 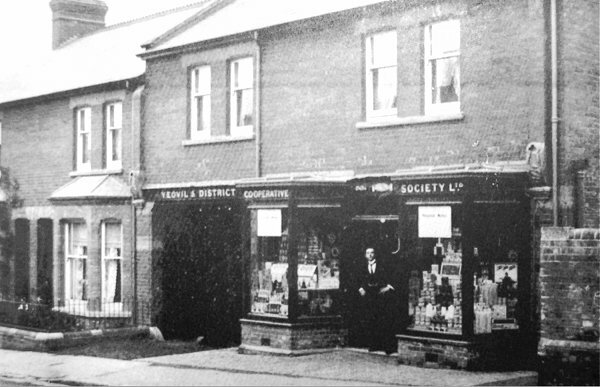 This was the Yeovil & District Co-operative Society's first branch outlet which opened in 1897 in Orchard Street. The archway led through to the Co-op's own bakery, where Charlie worked, at the rear of the premises. The funeral of Charlie Gillard. 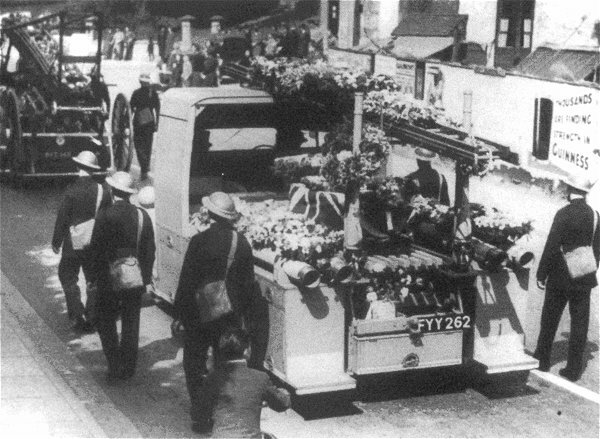 The Western Gazette reported "The coffin, upon which rested the deceased’s helmet, was born on one fire engine, and another was used to carry the numerous flowers. A section of a military band, the Pipes Band and Section of the King’s Own Scottish Borderers, led a procession of many organisations from King George Street to the cemetery, where a large number of friends and townspeople were gathered to pay their last tribute of respect." The memorial to Auxiliary Fireman Charlie Gillard. Photographed in 2014. The last remains of the Town Hall in Borough Arcade, at its centre the memorial to Auxiliary Fireman Charlie Gillard. Photographed in 2013.